The Pediatric Intensive Care Unit (PICU) provides critical care to infants and children ages 0 through 17. The unit provides specialized care for patients with complex, surgical, oncology, orthopedic, trauma, and medical care needs. The PICU staff work with patients, families, and caregivers to provide Patient and Family-Centered Care which follows a Code of Conduct based on values such as caring and respect. Contacting the PICU: When a child is admitted to the PICU, families/caregivers are given a card with a unique identifying number which must be given every time information is being requested over the phone. No information will be given by staff to visitors, friends or family members. Comfort measures: Families are encouraged to bring personal items from home that will provide comfort and support such as favorite toys, books and music. There are also photo boards in every room to display family pictures and well wishes as well as a whiteboard which is updated daily by staff. Families are also encouraged to update whiteboards and provide information that will help staff to get to know patients better. Accommodations for families with children in the PICU: One visitor is allowed to sleep at the bedside and a pull-out bed is provided for this purpose. Ronald McDonald House is located nearby to the hospital and is an option for families who meet acceptance criteria primarily based upon area of residence. All families wishing to access Ronald McDonald House will be assisted to apply upon admission to the PICU. 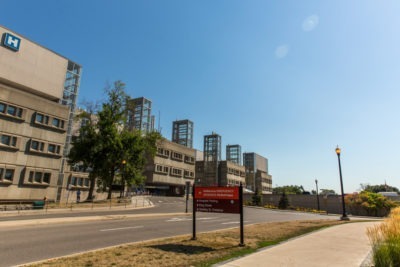 Transfer from the PICU: Patients who no longer require critical care in the PICU will be transferred to inpatient areas either within McMaster Children’s Hospital or if possible, be repatriated to community hospitals closer to their homes. Some patients are discharged directly home from the PICU and in these cases, arrangements are made by the PICU team for follow up care in the community. Research: Research is a very big part of seeking to provide excellence in healthcare and PICU staff are committed to providing the best care possible. There are many projects being undertaken within the PICU at any given time. All eligible patients are screened for enrollment but participation is 100% voluntary. The PICU does not have specific visiting hours but suggests limiting visitors after 10 p.m. to encourage good sleep. There is a limit of 2 people in the room at a time and visitors must be accompanied by a parent or guardian and of note, there may be times when visitors need to be restricted from accessing the PICU. Siblings of patients are welcome to visit the PICU and the PICU Child Life Specialist is available for support both before and after visits if desired. Due to the nature of PICU and the specialized equipment, no food or drink can be consumed by families or visitors in the PICU with the exception of water in a closed top container. It is essential that all families, visitors and staff practice excellent hand hygiene in the PICU. Hand hygiene pumps are located in multiple locations outside and within the PICU, including patient rooms. Compliance with hand washing is in line with hospital infection control practices and is an important way to keep patients safe. Pediatric Critical Care Fellow: Pediatricians who are getting more training in the care of critically ill children. Resident: Residents are doctors who are learning about the care of sick children. Registered Nurse (RN): The nurses who work in the PICU have additional training and experience providing intensive nursing care for very sick children. Respiratory Therapist (RT): The RT is a specialist in airway management and ventilation. Social Worker: The Social Worker provides support to patients and their families in the PICU, assists with resources and communicates with community agencies. Pharmacist: The pharmacist works very closely with the doctors and nurses to provide safe medication therapy. Pharmacy Technician: The pharmacy technician helps with preparing and distributing medication. Physiotherapist (PT): The physiotherapist helps children build their strength, mobility and regain physical function to the greatest extent possible. Occupational Therapist (OT): The occupational therapist helps children to develop skills needed to return to activities of daily life. Registered Dietitian: The dietitian is an expert in nutrition. Business Clerk: The business clerk greets and directs families and visitors to the PICU and supports the daily activities within the PICU. Child Life Specialist: The Child life Specialist supports patients and siblings to understand issues of care and provides emotional support and helps with coping strategies. Clinical Manager: The clinical manager is responsible for overall management of the PICU. Spiritual Care Worker: The spiritual care worker is available to support religious and spiritual needs of patients, families as well as staff. Visitors may access the PICU by using the phone located on the wall at the entrance to the unit.